January 2016 39 The deck transitions to an ipe fence to hide the detached garage. 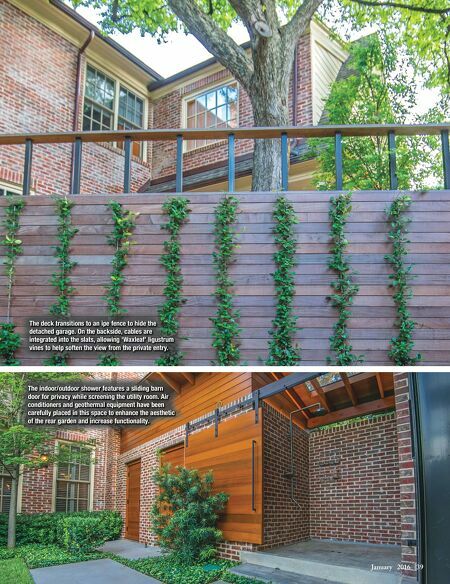 On the backside, cables are integrated into the slats, allowing 'Waxleaf' ligustrum vines to help soften the view from the private entry. The indoor/outdoor shower features a sliding barn door for privacy while screening the utility room. Air conditioners and geothermal equipment have been carefully placed in this space to enhance the aesthetic of the rear garden and increase functionality.